2Department of Internal Medicine, Creighton University Medical School, Omaha, USA. Received July 4th, 2011; revised August 6th, 2011; accepted August 25th, 2011. Carcinosarcoma of the prostate is a rare and aggressive tumor characterized by the coexistence of malignant high grade epithelial and mesenchymal components . Less than 100 cases of prostate carcinosarcoma have been reported in the literature, most often as single case report or limited series [2-10] with focus on histopathological characteristics. Microscopically, carcinosarcomas are biphasic tumors made of an intimate admixture of carcinomatous and sarcomatous components with abrupt or gradual transition from one to the other. In most cases, the epithelial component consists of high grade adenocarcinoma with possible epidermoid and/or glandular differentiation, while the heterologous component consists of chondrosarcoma, malignant fibrous histiocytomaosteosarcoma, leiomyosarcoma, fibrosarcoma or rhabdomyosarcoma [7-10]. The epithelial component is cytokeratin, PSAand PAP-positive. In a minority of cases, the spindle cell element expresses cytokeratin, but PSA and PAP are rarely positive . Clinically, these patients tend to be older, and present with advanced stage [1-6]; in roughly half of cases have a history of prostatic adenocarcinoma treated by radiation [3,4]. The tumors commonly produce bladder outlet obstruction and often require repeated transurethral resection of the prostate (TURP) to control local symptoms. Serum PSA levels are usually lower than expected for the tumor volume. The histogenesis of prostate carcinosarcoma is not completely understood, and various interpretations have been proposed for the heterogenous components of this tumor [11-17]. Some investigators suggested that these tumors develop as a result of undifferentiated, totipotential neoplastic cells that undergo multiple pathways of terminal differentiation into either mesenchymal or epithelial elements. This theory is supported by the presence of epithelial markers (cytokeratin or EMA) in mesenchymal areas and the presence of ultrastructural features (desmosomes or tonofilaments) of epithelial differentiation in sarcomatoid elements . Others believe that in cases where different components share no common features on immunohistochemical and electron microscopic examinations, carcinosarcomas might be the result of true “collision” tumors, where both malignant epithelial and mesenchymal components arise independently from each other . Several investigators evaluated clonality in both malignant epithelial and mesenchymal elements using genetics or molecular techniques. The tumor cells from both tumor components showed monoclonality and clonal identity in all cases studied, suggesting a monoclonal origin [13-15]. Other theories include carcinosarcoma might developed as a equence of conmetaplastic chondromatous response which subsequently became malignant in patients with primary adenocarcinoma of the prostate [17,18]; or originate from the mesodermal vestige within the prostate . Due to the rarity of this malignancy, current knowledge about carcinosarcoma of the prostate is limited to small retrospective case series and case reports. The clinical significance and biologic behavior of this subtype of prostate cancer remains poorly understood. To improve our understanding of this tumor, we have undertaken a comprehensive analysis of patients with carcinosarcoma of the prostate identified in the National Cancer Institute’s Surveillance, Epidemiology, and End Results (SEER) database. Surveillance, Epidemiology, and End Results (SEER) databases included patient records from multiple sites across the United States. The database was designed to reflect overall characteristics of the United States, including the variety of racial/ethnic groups, geographical locations. SEER 9, 13, and 17 registries cover approximately 9.5%, 13.8%, and 26.2% of the total US population, respectively . Data for this study were obtained from SEER*Stat public-use data files, available on the internet at the National Cancer Institute web site. The cases of prostatic carcinosarcoma were extracted from the SEER on the basis of anatomic site (ICD-O-2 codes C61.9) and histologic type (ICD-O code 8980) for those patients first diagnosed and/or treated between January 1977 and December 2007. Patients’ social demographic characteristics (i.e. age, race/ethnicity and marital status) and tumor grade and stage at the time of diagnosis, were determined from the SEER database. SEER general summary stage  classifies patients as having local, regional (extension into adjacent tissues or nodal involvement), or distant disease. The World Health Organization’s standard grading system was used with four separate categories (well, moderately well, poorly differentiated, and undifferentiated). For prostate cancer cases, SEER database recorded the highest value of PSA tests at the time of diagnosis under the variable named “Tumor Marker 2”. In the database, PSA was categorized as a) none, b) positive, c) negative, d) borderline, undetermined whether positive or negative, e) ordered, but results not in chart, f) unknown or no information . According to the available information, we grouped PSA levels into three groups in this study: above normal (positive), normal (negative) or unknown. Discrete data are reported as frequencies and compared by chi-square and Fisher’s exact tests as appropriate. Continuous data are reported as mean ± SD and compared by student’s t test. Cases identified at the time of autopsy or by death certificate only or with more than one primary were excluded from survival analyses. Survival duration was measured by the Kaplan-Meier method  and compared by the log rank test. Multivariate survival analyses were carried out using the Cox proportional hazard model. Hazard ratios and 95% confidence intervals were reported . All other statistical calculations were performed by SPSS 12.0 (Apache Software Foundation 2000). Comparative differences were considered statistically significant when the p value was <0.05. Between 1977 and 2007, a total of 54 patients with histologically confirmed carcinosarcoma of the prostate were identified in the SEER 17 registries. The median age of these patients at diagnosis was 74 years, with a range of 28 to 94 years. Forty-six patients (85.8%) were white, while African American accounted for 5 (9.3%) patients. Other ethnicities accounted for 3 patients (5.6%). Details of patient and tumor characteristics of study cohort are included in Table 1. Table 1. 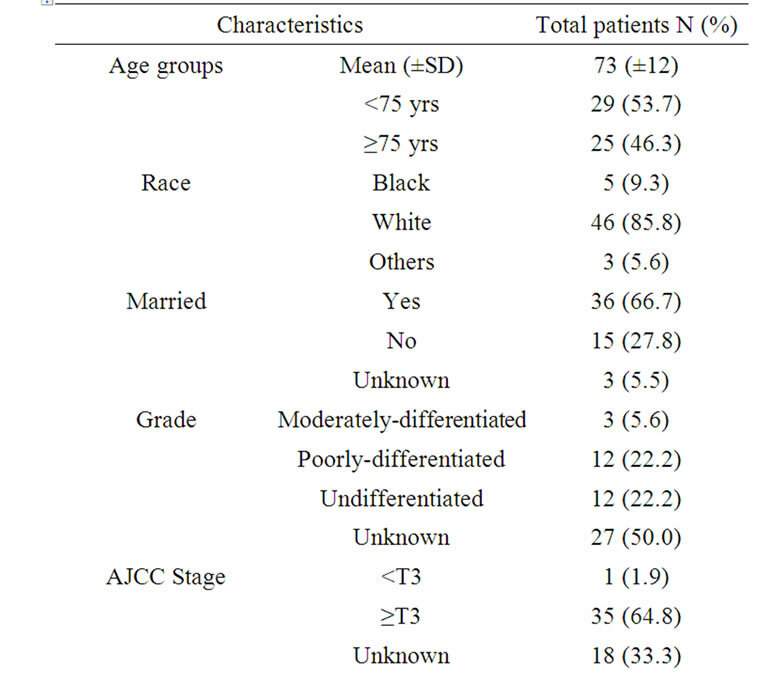 Characteristics of 54 patients with carcinosarcoma of the prostate diagnosed between January 1977 and December 2007. Most of patients (70.4%) were treated with cancer directed surgery (CDS): twenty patients (37.0%) underwent transurethral resection of the prostate (TURP) only and fourteen (25.9%) patients underwent radical prostatectomy. 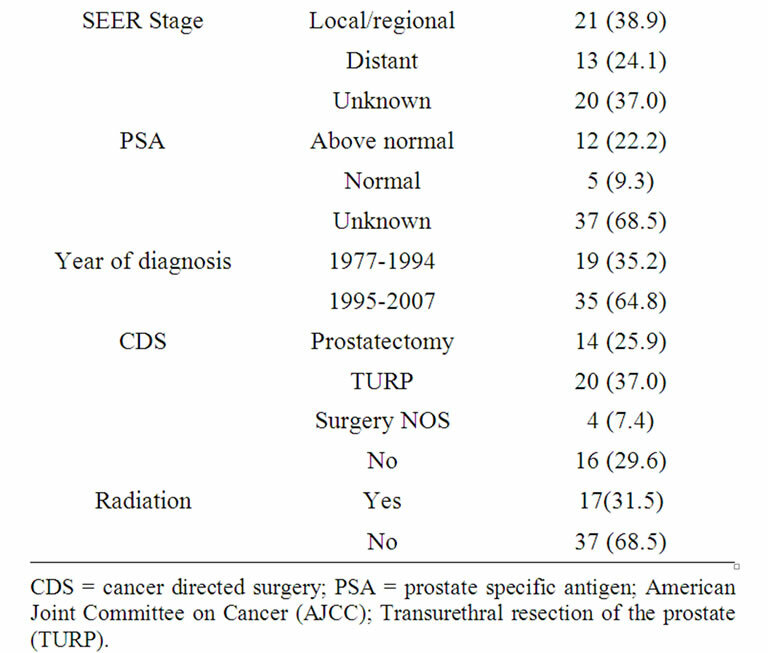 Seventeen (17.9%) of patients received radiation therapy, among them, nine patients received radiation therapy as primary therapy; eight patients received radiation in combined with cancer directed surgery (One patient received radiation before radical prostatectomy; five patients received radiation after radical prostatectomy; one patients received radiation after TURP; one patient received radiation before and after radical prostatectomy) (Table 1). All patients had active follow-up (range 0 - 127 months); 48 of 54 (88.9%) patients died during the follow-up period. Figure 1(a) presents Kaplan-Meier survival curves for overall survival of entire cohort. The median overall survival was 13 months (95% CI 8 - 18 months) (Figure 1(a)). Figure 1(b) presents Kaplan-Meier survival curves for cancer specific survival of entire cohort. 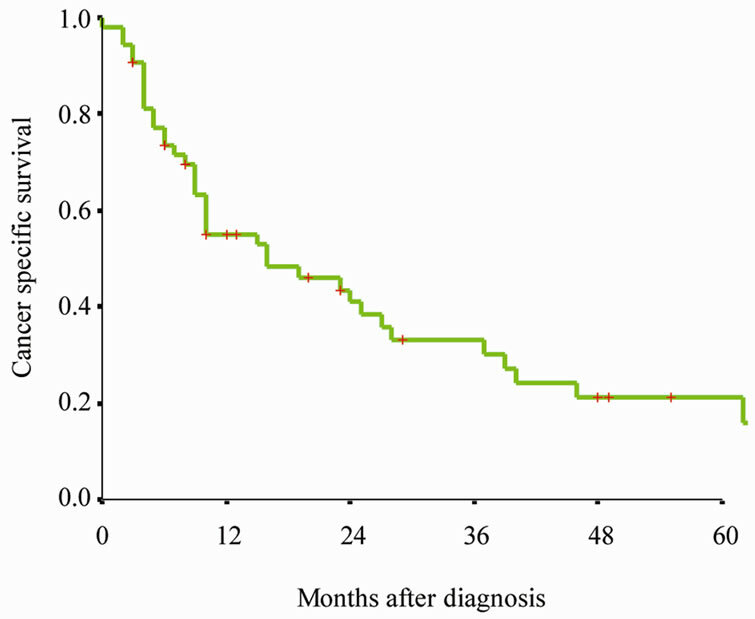 The median cancer specific survival was 16 months (95% CI 0 - 32 months) (Figure 1(b)). Table 2 presents the 1-, 3-, and 5- year cancer specific survival rate according to patients and tumor characteristics. Figure 1(c) presents Kaplan-Meier survival curve according to therapy. There is a significant difference of cancer specific survival among those who underwent prostatectomy and those did not (p < 0.001). Table 3 presents the result of multivariate survival analyses using Cox proportional hazard model. 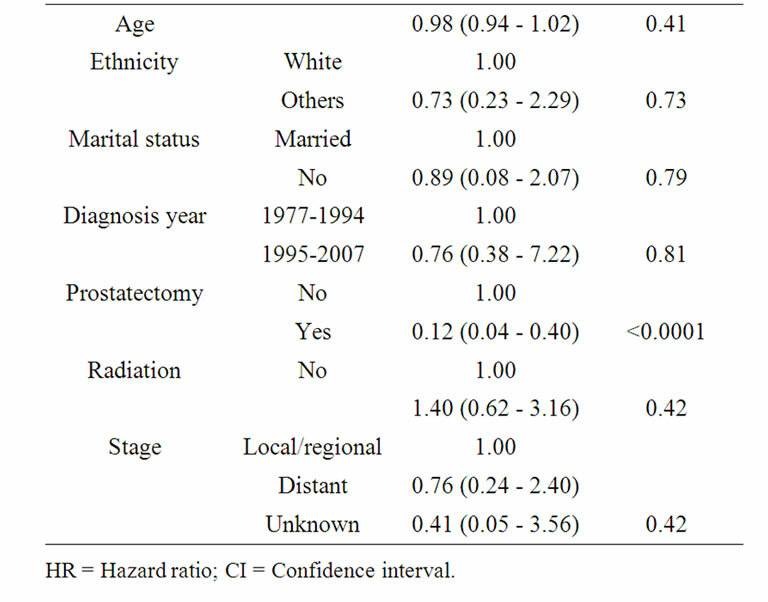 After adjusting for the demographic, clinical and treatment related factors, only prostatectomy was identified as an independent factor associated with cancer specific survival (HR = 0.175; 95% CI 0.064 - 0.478; p = 0.001). Table 2. 1-, 3-, and 5-year cancer specific survival of patients with carcinosarcoma of the prostate according to demographic and clinical characteristics. Figure 1. Kaplan-Meier survival curves for (a) Overall survival of entire cohort, (b) cancer specific survival of entire cohort, (c) cancer specific survival rate of patients by therapy. P value shown for log-rank test between two groups. patients with prostate cancer, due to the perception that the re-biopsy of these patients in the face of known prostate cancer is not warranted, especially in the case of elderly patients with advance stage disease. Inconsistent use of a standardized pathologic classification likely account for the conflicting results of many clinical series [4-8]. Numerous nomenclatures have been used to identify these tumors. Wick and Swanson preferred the unifying term “sarcomatoid carcinoma” due to the presumed origin from carcinoma with varying degrees of divergent differentiation, including sarcomatoid pattern . In some case, carcinosarcoma of the prostate may be classified as metaplastic carcinoma, spindle-cell carcinoma, and malignant mixed mesodermal tumor. Based on above, some investigators postulate that the incidence and clinical impact of this subtype of prostate cancer are likely underestimated and underreported [19,20]. Table 3. Multivariate analyses of factors associated with cancer specific mortality in patients with carcinosarcoma of the prostate. respectively . 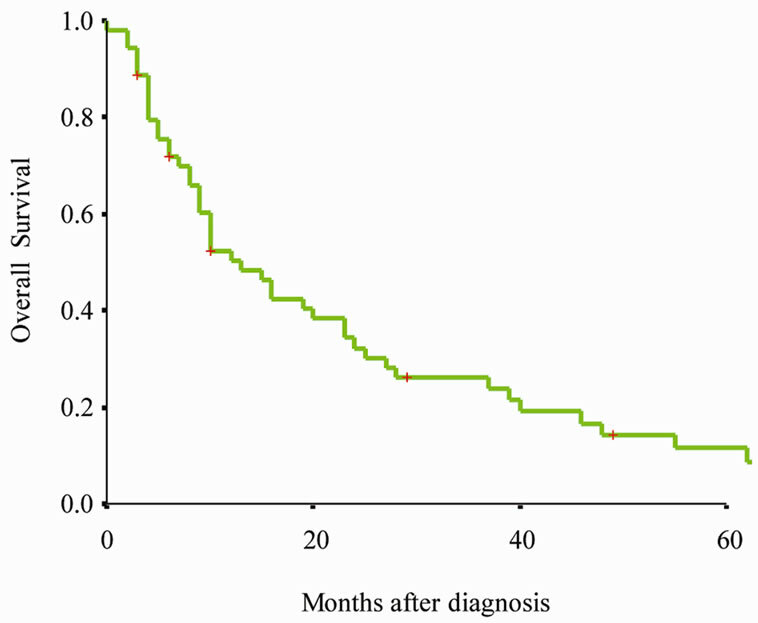 The clinical characteristics of patients with carcinosarcoma of the prostate in this study consistent with previous published single institution studies, the cancer specific survival of this cohort of carcinosarcoma of the prostate was poor. In our study, the 1-, 3- and 5- year survival rate of carcinosarcoma of the prostate were 50.4%, 26.2% and 11.4% (Figure 1(a)). Our findings confirmed prior reports that carcinosarcoma of the prostate is a highly aggressive subtype [2,4,7], carcinosarcoma of the prostate should be treated as a separate entity distinct from ordinary adenocarcinoma. Owing to the rareness of carcinosarcoma of the prostate, there is no standard treatment for this disease. Transurethral resection of the prostate (TURP) carries the risk of incomplete tumor resection. Therefore, radical prostatectomy is the treatment of choice [4,6,7,9,24]. In this study, a multivariate survival analyses indentified prostatectomy as the sole independent factor associated with favorable cancer specific survival. The prognosis of this tumor remains poor, even in those patients with resectable disease, local recurrence and/or metastasis rates were very high after radical surgery [4,6]. The overall 5-year cancer specific survival rate after prostatectomy in our study population was only 21%, suggesting a high risk of early dissemination at the time of prostatectomy. Accurate staging is an important for proper disease management. Curative therapy can only be performed in patients with localized prostate carcinoma. However, clinical staging to differentiate between localized and advanced disease stage appear to be unreliable [26-28]. Meticulous presurgical staging and selection of appropriate surgical candidates is essential. Multimodality treatment including prostatectomy, preor postoperative radiation therapy, and neoadjuvant or adjuvant chemotherapy have been used in the management of carcinosarcoma of the prostate, but there are no standard treatment recommendations [2-4,7,11]. Patients with bulky disease may be treated with neoadjuvant (preoperative) chemotherapy with or without radiotherapy followed by an attempt for surgical resection. Our findings should be interpreted within the limitations of the study. This is a nonrandomized study; therefore, selection bias might have been present because patients undergoing prostatectomy tend to be healthier. Although we adjusted for differences in demographic and clinical features, residual confounding might be present. In addition, our data did not allow us to examine surgical volume, hospital characteristic, receipt of chemotherapy, and patient comorbidities, all of which are factors presumed to influence survival in cancer patients . However, the use of cancer specific survival rather than overall survival in our study has modified the limitation to some degree. Finally, sample size in our study may still not be enough to fully describe the factors that affect the incidence, treatment choice, and survival of this rare tumor. In summary, carcinosarcoma of the prostate is a highly malignant neoplasm, occurring predominantly in elder males with an advanced stage at presentation and with poor prognosis. 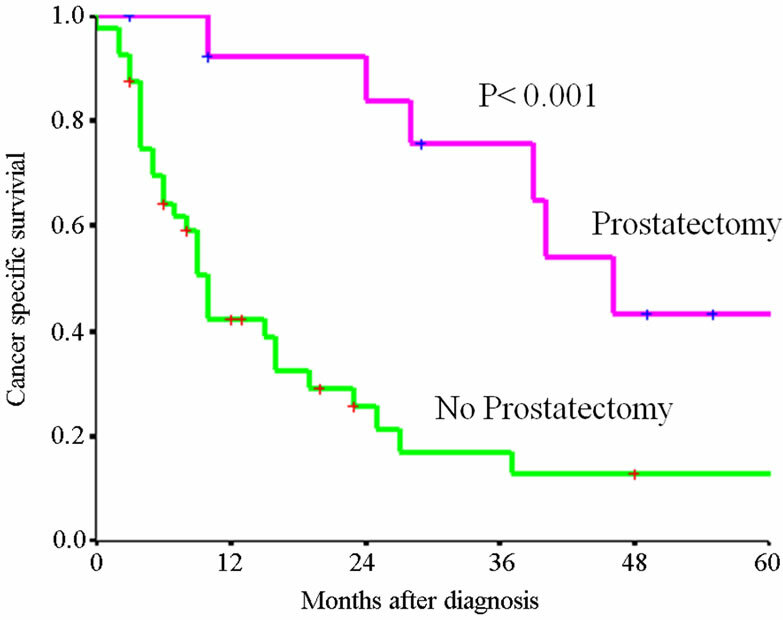 Radical prostatectomy is the only treatment modality that significantly improves survival. Accurate histological diagnosis, meticulous presurgical staging and selection of appropriate surgical candidates are essential. Emphasis on early diagnosis and detection and multimodality therapy of this disease is needed to improve the outcome for patients with this malignancy. The authors acknowledge the efforts of the Applied Research Branch, Division of Cancer Prevention and Population Science, NCI; and the Surveillance, Epidemiology, and End Results (SEER) Program tumor registries. Interpretation and reporting of these data are solely the responsibility of the authors. A. A. Renshaw and S. R. Granter, “Metastatic Sarcomatoid, and PSAand PAP-Negative Prostatic Carcinoma: Diagnosis by Fine Needle Aspiration,” Diagnostic Cytopathology, Vol. 23, No. 3, 2000, pp. 199-201. D. E. Hansel and J. I. Epstein, “Sarcomatoid Carcinoma of the Prostate: A Study of 42 Cases,” American Journal of Surgical Pathology, Vol. 30, No. 10, 2006, pp. 1316- 1321. L. Thompson, B. Chang and S. H. Barsky, “Monoclonal Origins of Malignant Mixed Tumors (Carcinosarcomas). Evidence for a Divergent Histogenesis,” American Journal of Surgical Pathology, Vol. 20, No. 3, 1996, pp. 277- 285. M. E. Ray, K. J. Wojno, N. S. Goldstein, K. B. Olson, R. B. Shah and K. A. Cooney, “Clonality of Sarcomatous and Carcinomatous Elements in Sarcomatoid Carcinoma of the Prostate,” Urology, Vol. 67, No. 2, 2006, pp. 423.e5- 423.e8.